The art for this station recognizes the area's earliest inhabitants, offering riders the chance to step back in time. Artist Leticia Huerta's design pays homage to the native wildlife - a total of 190 different birds, bats, foxes, coyotes and other creatures that call the neighboring Great Trinity Forest home. 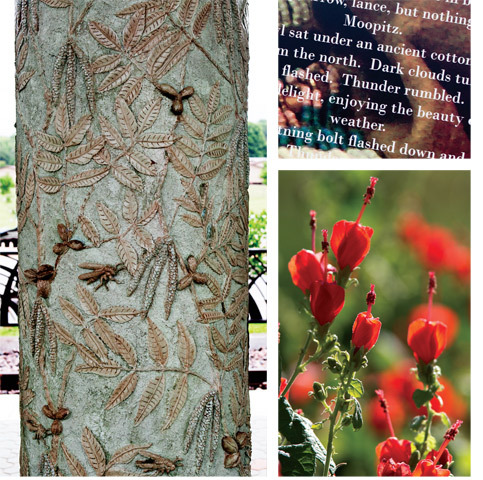 The art also reflects the trees indigenous to the area, including pecan, walnut and maple. Since the location once served as a junction where Native Americans and pioneers traded with travelers, Huerta incorporated poems and narratives from Native American books into her design. Also, riders should take note of the storytelling wall that has been erected between this station and Lake June Station. The wall is symbolic of a similar wall that once stood in the same place, which told tales of the Comanche people. To honor the hunter-gatherers that once roamed this land, the paving has the appearance of a dried-up riverbed, with impressions of leaves and animal tracks stamped into the bed next to brown and green pavers. The columns depict impressions of berries, nuts, leaves and insects - cast into green concrete - again in reference to the nearby forest. 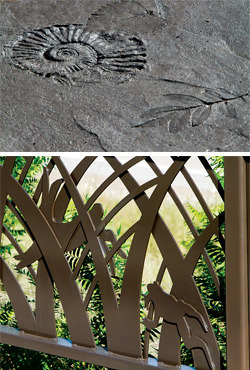 The fencing also gives homage to the forest, with metal shapes representing the various wooded creatures. When you see Huerta's vision for the station, you get a real appreciation for the people who were going green before it was even in style: the hunter-gatherers.